This season Sea to Summit released three new pillows. I recently got a chance to try out the Aeros Ultralight Pillow. Did it leave a crick in my neck or help me drift off to blissful backcountry slumber? Read on to find out! The Aeros Ultralight pillow is a very lightweight pillow that is made from comfortable materials that are easy on the face. Many times the welded seams on pillows are somewhat sharp and require you place the pillow inside an extra tshirt to keep your face safe as your roll around at night – no need with the Aeros Ultralight Pillow. The inflate/deflate valve works well and didn’t pop open even when I accidently sat on it. I really like the overall size and shape of the pillow. It fits nicely inside the hood of a sleeping bag without stretching it into an awkward shape – the arc shape on the top helps with this considerably and keeps it from moving around as you move in your sleep. I also like the arc on the bottom as well. 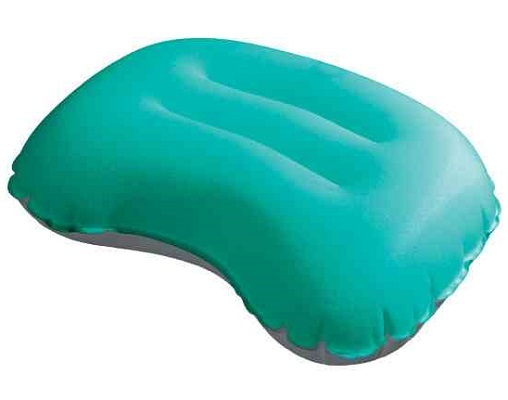 It allows me to get my head into the center of the pillow and comfortably support my neck. The ridges in the pillow are said to help keep your head locked into the center as well – which seemed to work and didn’t make things uncomfortable. One thing to note (and this advice carries over to inflatable sleeping pads) is that not everyone likes a fully inflated, about to burst, pillow. Its worth playing around with it a little bit to find the right level of inflation for you. Note: The Sea to Summit Aeros Ultralight is very similar to the Aeros Traveller pillow – I would recommend you read my Traveller review in addition to this one. If you want a pillow you won’t find a better ultralight pillow than the Sea to Summit Aeros Ultralight Pillow. This entry was posted in Activities, Activities, Alpine Mountineering, Activities, Backpacking, Brands, Activities, Car Camping, Gear, Gear, Pillows, Activities, Sea Kayaking, Brands, Sea to Summit, Activities, Ski Mountaineering, Activities, White Water Rafting.